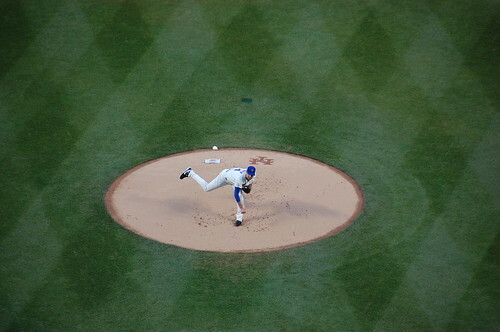 You love a pitchers’ duel but a ballpark in many ways does not love a pitchers duel. The 9 year old kids do not love them, as they tug on their parents’ sleeve and ask when is the apple going to go up. The non-fan boyfriend/girlfriends do not love them, and keep asking when is something going to HAPPEN and can we go to Shake Shack, you’re not going to miss anything. There is an air of excited expectancy over the first few innings which settles into a lull after about the fourth or fifth inning. Yes, there are those who are riveted to their seats for every pitch, or at least at the end of an inning when Mike Pelfrey has once again made short work of the Padres lineup, 1, 2, 3 and you look at the pitch count and think it is an error and then you realize it is not. You realize that Mike Pelfrey is not a fluke. 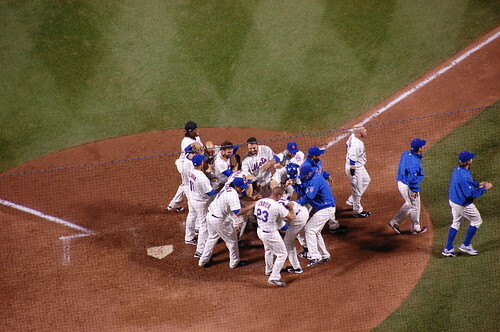 You realize that Mike Pelfrey has become, as Ike Davis put it at the end of the night, a big game pitcher. Then there were the almost-and-were-rans. 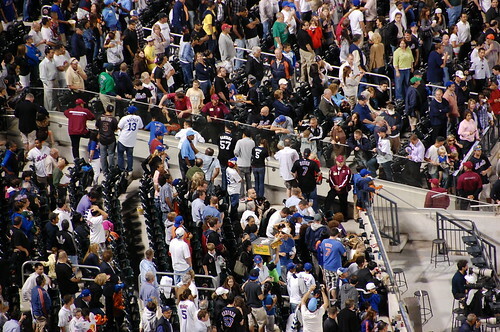 Jose’s HR was the funniest, as everyone is cheering, the apple is apple-ing, people are dancing, high-fives are all around – only to be halted like a needle being dragged across a vinyl record, as the umpires decide They’re Not Sure and head inside to take a look. Fans stand around waving their hands over their head like a herd of cowboys, others eagerly hang over the railing along the tunnel as though they were waiting for the Beatles to emerge. 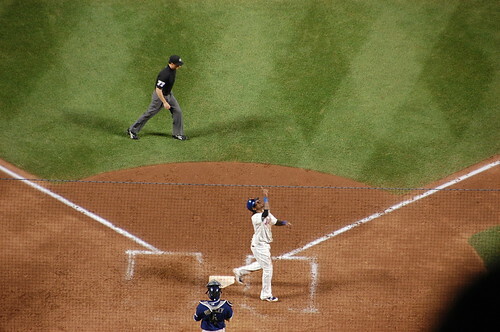 I will be truthful and note that TBF did prophecy Jose’s home run, announcing to anyone who would listen (meaning: me) that what we needed right now was a good old-fashioned solo home run exactly one pitch before Jose hit that ball. I swear. (Afterwards of course he would point out that he prophesied it because he knew that Big Boys Club or not, Mike Pelfrey wasn’t going to be hitting that solo home run.) 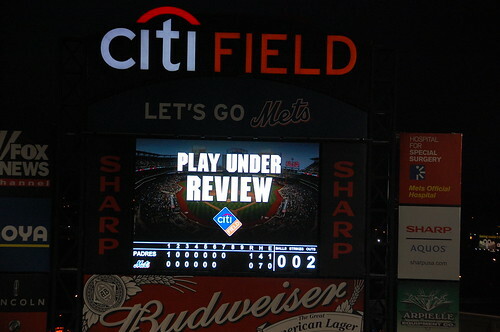 I will also point out that while I was good tonight, not once saying things like, “Wow, I love this, the game is moving so fast” or “Gosh, what a refreshing change, a game moving at a brisk pace” or even THINKING how nice it would be to get home at a decent hour (especially since we are back at Citi Field tomorrow), at some point in the 10th inning he confessed that he thought every single one of those things. “WHAT? You thought that?? I blame you for this,” I said, smacking him on the top of the head, right on the button of his hat where I knew it would smart the most. Back to Mike Pelfrey. We were pulling for Jerry to let him come back in, we were praying for it, people were chanting LEAVE PELFREY IN and generally trying to make their displeasure known. 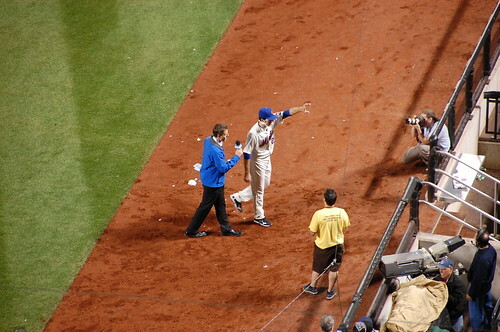 And he was brilliant to the end, walking off the mound after that final out in the 8th and heading to the dugout steps for handshakes and highfives all around. The scoreboard sent him off nicely. Of course I will claim ultimate victory on prophesy this evening, when I decided to wear my brand new WE LIKE IKE shirt to the game. I am sorry there are no pictures, I tried. (I am so looking forward to the front-facing camera on the iPhone.) But I have witnesses, before, during and after the game. I mention “before” because, as anyone who follows me on Twitter knows, I had an encounter with four game-going individuals who got on the 7 train at Times Square and proceeded to mock me for wearing it – “Oh honey, you didn’t wear your special shirt.” Headphones took care of them (as did the fact that they had no idea how to ride a subway and got squished every time the door opened, thought the 59th Street Bridge was the Triboro and that the Whitestone was the Tappan Zee) as does the consolation that Those People always leave games early and they didn’t get to see that glorious, soaring, completely unexpected Ike Davis home run. No, I did not think Ike would do it. I love Ike – I bought and wore the shirt! – but I like to temper my enthusiasm with just a soupcon of realism, given that these are still the New York Mets and could turn into a pumpkin ANY DAY NOW. 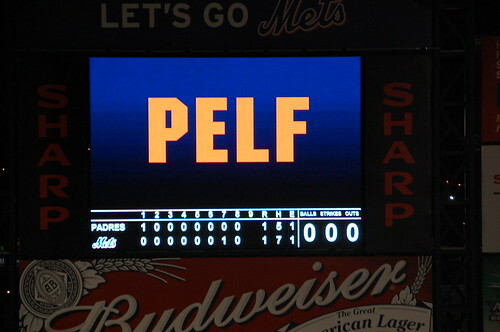 I would have even been basically okay if the Padres had won because (one fielding gaffe aside) the Mets had played quality baseball and Mike Pelfrey had pitched like a champ. Well maybe not ‘okay’ okay, but I would have been able to say that a 1-0 game where that 1 was the result of Adrian Gonzalez hitting a double to bring in Chase Headley Lamarr was not exactly a poorly played game. Luckily, I did not have to think that. 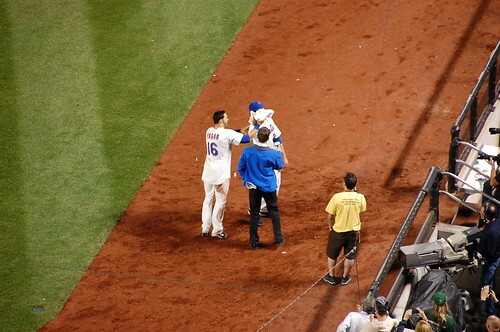 Or say that, thanks to Ike Davis. From the instant the ball hit the bat everyone knew, everyone leapt to their feet in that gigantic rocket roar that signals one thing, only one thing, and I lost it in the lights but saw the fans on the Shea Bridge heading for the Pepsi Porch and knew it was incredible, and the apple is up and people are cheering and the scoreboard reads WE BELIEVE IN HOME FIELD ADVANTAGE the dugout is emptying and Jose’s jersey is untucked before Ike is around second base, and I can see Barajas with his hands out as though he is saying AWESOME DUDE BUT REMEMBER KENDRY MORALES and there is a dogpile and then it disappears and just when you’ve taken your final excited breath, the live post-game interview, one of the things the Mets absolutely do not get enough credit for, is announced on the scoreboard. In Japan they call this the Game Hero interview, and they do it in the outfield near the ouendan, the cheering section, since the cheering section stays after every game to sing their cheers for the winning team and the losing team and it takes quite a while. And we have Kevin Burkhardt at the dugout with Ike Davis on the field and god bless TBF for saying, “Angel Pagan is coming with the shaving cream!” so I didn’t miss it. And Kevin throws Ike that softball so he can say that the fans make the difference at home, but he is not wrong, and it’s not pandering, because he is right. It is different. It is better. It is not the gloom and doom of 2009. It is only June, and I am not clearing my dance card for October, and I am, in fact, a little concerned about the road record and my July West Coast trip. 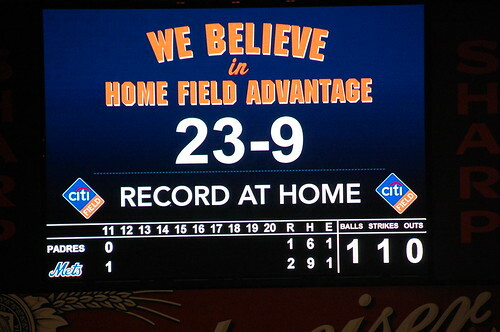 But right now, I can go see the Mets at home playing enjoyable baseball and that’s more than I thought I could have hoped for two months ago. P.S. 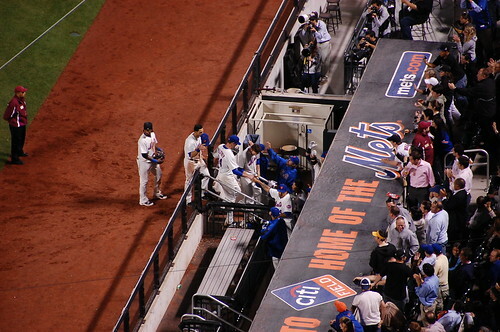 Ike Davis, please get another walkup song, there are no more appropriate lyrics left in “Start Me Up” that I can use for post titles.